Following our March road journey to Melbourne and back, and encouraged by the enjoyment we experienced on that occasion, we set out just over two weeks ago to South Australia, a trip that covered 4500km, and provided us with many wonderful experiences, from strikingly diverse scenery to dining on delicious seafood and much else in between. I’ve long wanted to visit Broken Hill, the outback city almost on the border between New South Wales and South Australia. 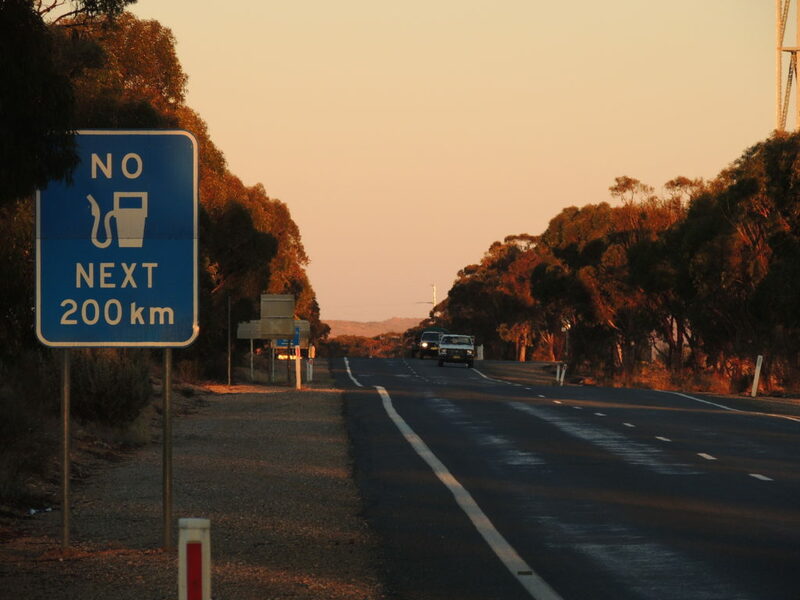 Approximately 900km away from where we live, this city is, for us, a two day car trip through semi-arid country on a long grey ribbon of road. 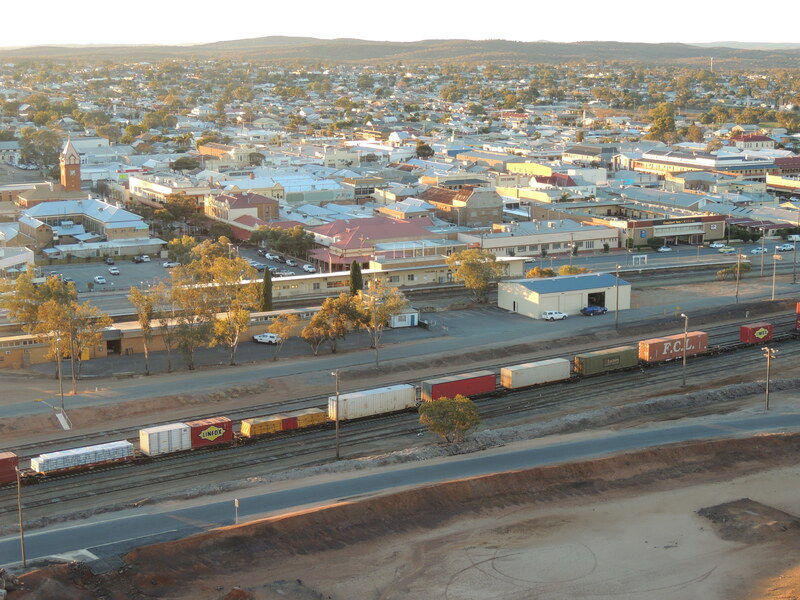 Broken Hill is Australia’s only heritage listed city. 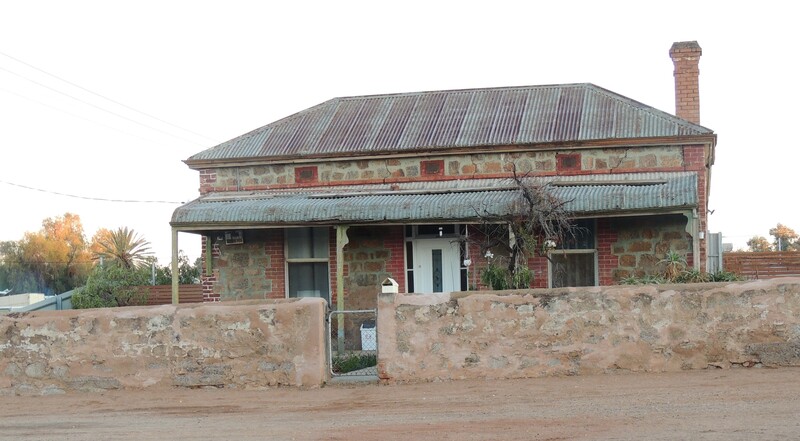 In addition to its long mining history, there are many old buildings of significant interest (including twenty pubs), houses built of corrugated iron or local stone and mining apparatus all set in a vast landscape. 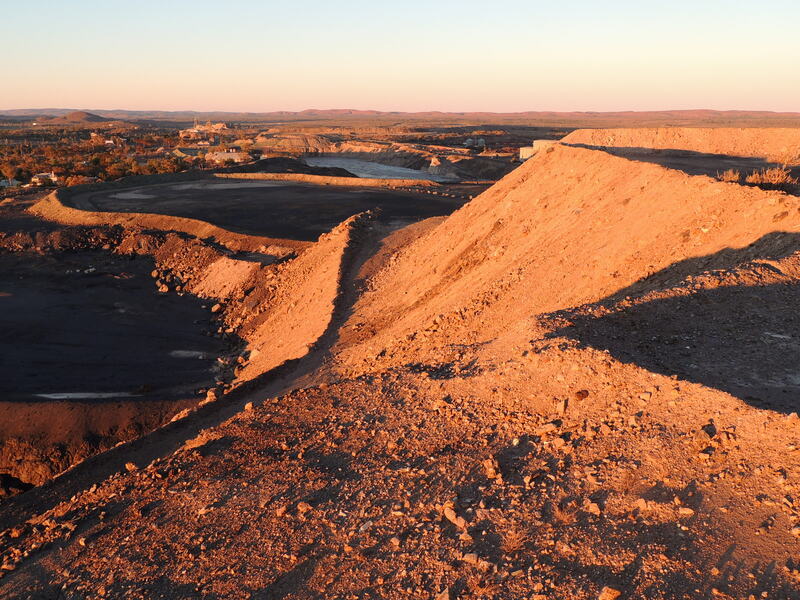 Visible from anywhere in the centre of the city is a hulking hill of tailings called the Line of Lode, from the top of which the visitor can see the city, the mines and the surrounding semi-arid countryside. Silver, lead and zinc are mined here, and have been for more than 130 years but the supply is running out and the population dwindling. There were 35 000 people living in Broken Hill in the 1950s: now there are 17 800. Once there were 70 pubs: probably most of them are still there, but many of them are empty, idle buildings. They still have their charm though, with their wide verandahs stretching out over the footpaths and their intricate lace balconies. Below is the Palace Hotel (still very much patronised) which featured prominently in the movie 'Priscilla, Queen of the Desert'. This the old convent, where we stayed. One of the most amazing things about Broken Hill is that after driving just a few minutes in the car in any direction, it’s possible to be out in the sere countryside, and from the top of the Line of Lode mullock (or tailings) mound the view is boundless: red earth and harsh scrubby country with an overarching blue sky in every direction. Dramatically crowning the mound is the Miners’ Memorial. 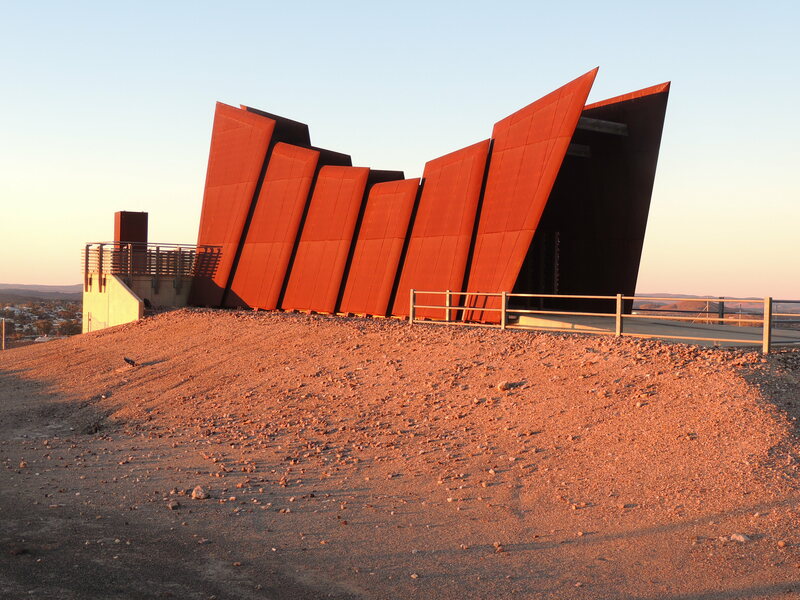 Constructed from steel, its rusty colour echoes that of the surrounding landscape and commemorates every miner who lost his life working here: just over 800 of them. A rose for every miner. The photo above illustrates just how close the city is to the bush. 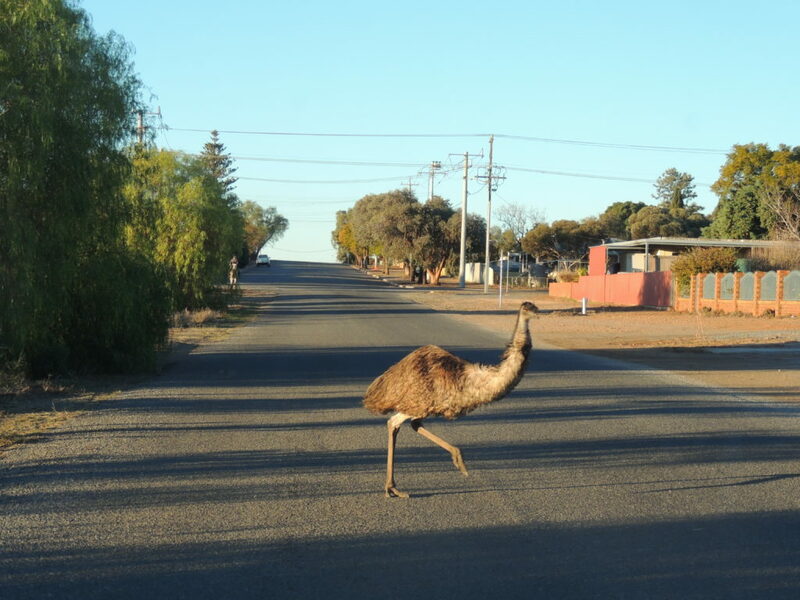 This emu has dropped into the suburbs to see if it can find something to eat! So far this year, Broken Hill has had 18.4 ml of rain. Less than one inch, in seven months. The reliable eucalypts go on doing their thing, but a majority of houses lack any kind of garden and definitely have no lawn, merely bare dirt in front of the house. However, it is possible to garden in this climate- more about that in another post. 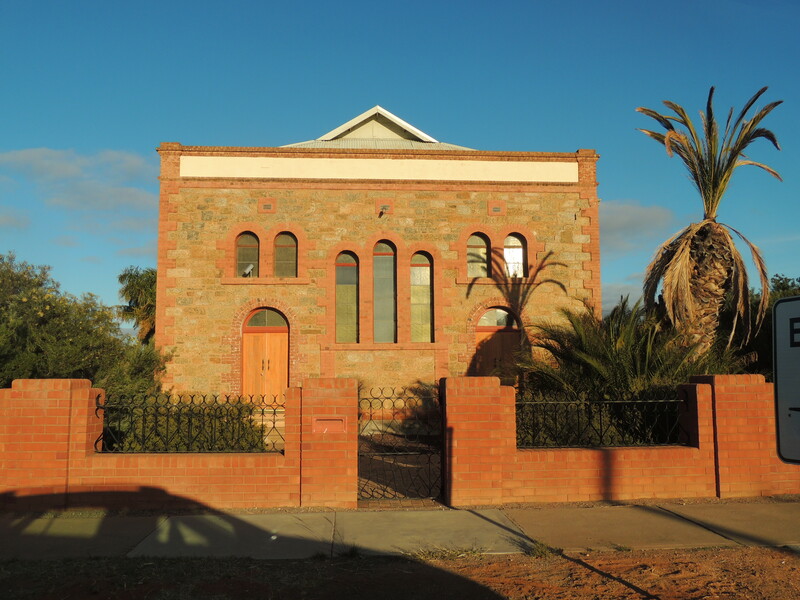 Broken Hill is a fascinating city: for its rawness, the tenacity of its people (and many of them are doing it hard) its architecture, its industry and its remote position in the almost-desert countryside. Although there is a lot more to see there and I could easily have stayed longer, I'd satisfied my curiosity up to a point, and it was worth the long drive. But we had to move on. We had more ahead of us! Previous Post SoS, July 7: Small Bright Spots. Very interesting! Now I’m looking forward to the post about gardens! Thanks Liz, I’ll post something about gardens soon. Wonderful post and images, Jane. I’d love to see inside that Cottage – I’ll bet it has stories to tell. Thanks so much Vicki, I’m glad you enjoyed it. The cottages were very interesting, and there was a variety of styles and building materials. There would be some pretty sad stories connected to those cottages, I think. And happy ones too, I hope. Loved the houses with decorative pressed metal on the oytside…more commonly seen in ceilings. It has a huge water problem but I loved it. We went there to see the soring flowers in a good season. You were lucky to see Broken Hill in a good season, Judith, I think it would be wonderful to see those wildflowers. What a trip, Jane. What a lot of driving. Broken Hill must have been fascinating. The memorial to the miners is so touching, and is a stark reminder of how dangerous such work is. I’ve always wanted to go to Broken Hill. In the dim, dark past I had a meeting with some people on the Broken Hill local council and their business development organisation. They were all so lovely, and doing so much to try to attract new investment and visitors to the area. I was so impressed with their initiative. I hope you get there one day Tracy (family holiday perhaps?) as it’s certainly worth a visit. I was quite overwhelmed by the memorial: each miner’s name is listed along with the cause of death, a terrible toll over the years. Yes, you must go Pauline, I know you’ll enjoy it. And it will be interesting to get your perspective on it when you post! Oh, thanks for your comment Lis, I’m glad you enjoyed the post. I hope your garden survived while you were on your long trip! What an adventure! Desert towns in the US generally make me sad but I’m impressed that so many people have made a go of life in a climate like this for as long as they have. The Miners’ Memorial is impressive to say the least. I look forward to your next posts! Thank you Kris. I know what you mean about sad towns, and we passed a few on our trip, but Broken Hill seemed not to be so, perhaps because it’s bigger. It’s quite touristy too, so plenty of people passing through. It also has a terrific art gallery and lots of artists live in the area. Wonderful, you’re travelling again! I can’t get enough of Australia and I do love the outback. I’ll be fascinated to read more. Emus seemed to be everywhere in South Australia. In December the males had long lines of youngsters in tow.. stopping the traffic! I’ve read some of your posts about Agustralia Jessica, and your enjoyment of the country shines out of the page! We saw quite a lot of emus too, but no dads being baby sitters. We don’t get emus where we live. Thanks for the comment. Broken Hill looks like an interesting place to visit! I love old mining towns with their wonderful character and history. Yes, they’re great places to wander around, Kristah. You have brought back happy memories of my brief visit to Broken Hill back in December 1998. It was baking hot (40 degrees or more) and Aussie friends of my son and his in-laws thought I was mad. “Why do you want to go there?” “We’ve never even been there.” “There is nothing there.” How could I explain that I wanted to see the real Australia (for me), not just the metropolises (metropoles) which frankly could be anywhere. How could I explain that I found Sydney a cleaner version of London. How could I explain that I hadn’t found the soul of Australia. Did you find there was plenty to see Jude? And did you find the soul of Australia? I’d love to go back for another visit myself: it’s a fascinating place. I find myself thinking about it quite often. What a fascinating post. 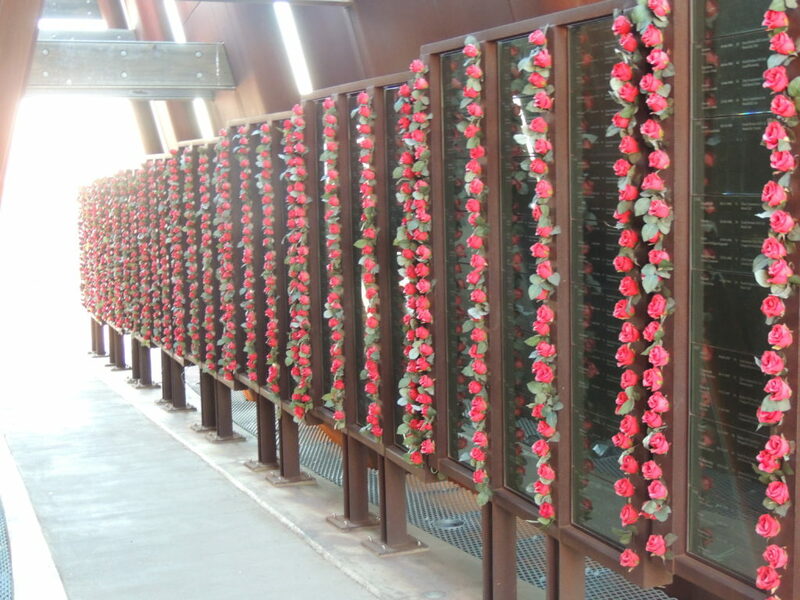 All those roses representing miners who died was moving. Lovely to see the emu strolling across the road. Looking forward to seeing how people garden in this sort of climate. Thank you Chloris. I found the memorial moving too: as well as the miners’ names it tells how they died and their ages, some rather young as you could imagine.